The suites at TWO THIRTY-FIVE transport you to a luxurious experience with all the comforts of home, nestled in the heart of beautiful, historic Healdsburg - the center of Sonoma Countys rich wine culture. These luxury suites are the perfect base from which to explore wine country. 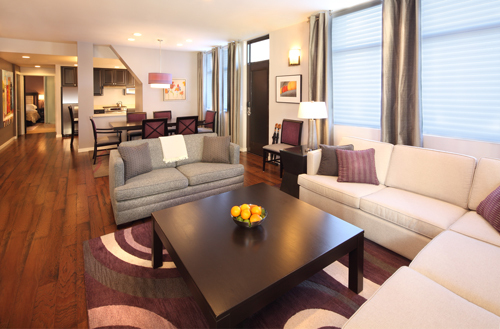 The spacious three-bedroom suites have all the comfort of home and then some. You will be 100 feet from Healdsburgs Plaza with some 20 fine restaurants within a two-block walk, including the world-renowned Dry Creek Kitchen, not to mention dozens of tasting rooms and boutiques. You can spend the day exploring the vineyards and then head out to a world-class meal, or simply come home and put your feet up, taking advantage of the suites full kitchen. Each room has a dedicated WiFi router with a 50MB Internet connection. You will have access to a full range of premium channels on 55-inch TVs in the main living room, with 42-inch TVs in all the bedrooms. All are equipped with media hubs so it is easy to connect your devices. Nest thermostats are installed in each bedroom, making it easy to find the temperature that is perfect for you. You will be on the second floor of a secure building with elevator access and two reserved parking spaces. Our on-site staff is there to answer any of your questions. We can help you organize tastings, bike tours, or private cooking lessons to make your wine country dreams a reality. Notes: Balcony in Fitch Mountain and Foss Creek suites only. 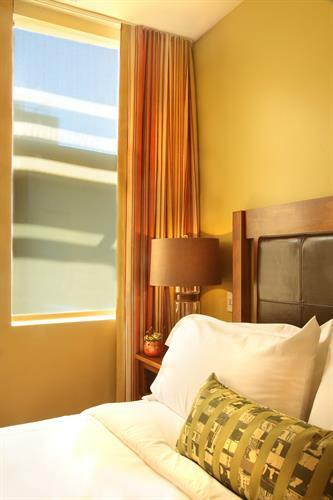 While the suites are located at 235 Healdsburg Avenue, our parking lot is accessed from Matheson Street. If you're using GPS to navigate here, the parking lot address is approximately 12 Matheson St.